For over 30 years I have introduced Amateur Fadio at residential camps where I’ve worked. Since 1999, I’ve worked at the Henry S. Jacobs Camp, located south of Jackson, Mississippi. This Jewish residential camp serves youth from all over the country, but draws most of its participants from Louisiana, Alabama, Tennessee, and Mississippi. For two weeks in the summer I serve as a clergy resource for the campers and staff, but my primary role has been working in the digital media program area. In my Amateur Radio introduction, I use a Kenwood TS-430S, a Heathkit HA-10 “Warrior” HF amplifier that was donated by a congregant, and a G5RV antenna stretched out in several high trees. Typically when the children come to camp, all the elective choices are presented to the campers by age group. Because the radio room can only accommodate about eight campers, I cannot take everyone who made Amateur Radio their number one choice. 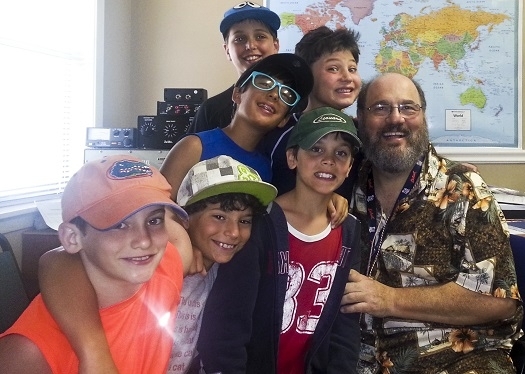 Joel Colman, NO5FD and campers in the radio room at Henry S. Jacobs Camp. When I welcome a group to the Amateur Radio station, I explain the basics of the hobby and then go over the phonetic alphabet so the campers can understand the language being heard on the radio. I explain the concept of calling CQ, why we must look for an open frequency first, and that we may not always get a response when we call CQ. I will have a script ready for the campers to use when they call CQ. This way, if I want them to call a new sequence of CQ, I can simply point to that part of the script. I like using a microphone with an off/on switch, as some children cannot squeeze the PTT button fully. Once a CQ is answered, I have another script ready to go, where I write down the call sign, signal report, and the name of the contact. I also encourage the campers to tell the contact what city they are from, their age, what they like about camp, what their favorite food at camp is, etc. I also like having QRZ.com loaded on my laptop, so we can look up the call sign of the contact, and then we can look up in the atlas where the operator is located. During my time with the campers, one of my objectives is to explain the radio spectrum. I start with the AM band, since the campers usually understand that part of the spectrum. I highlight why frequencies in the AM band react differently at night, which gives me an opportunity to explain DX communications later. I then take them higher up the frequency chart, discussing certain slivers of band, such as where aero communications take place, Amateur Radio band frequencies, military communications, and shortwave. I also like to point out NOAA weather frequencies in the 150 MHz band, FRS/GMRS radios, police & fire, cellphone frequencies, and even the frequencies that some fast food restaurants use for the drive up windows. I highlight the location of FM radio, which campers still listen to, so I can put a familiar radio frequency in a framework. Then when we dial around the 20 meter band looking for a QSO, the campers have a stronger concept of why we are on that frequency. There are other activities that take place in the Amateur Radio program, such as playing a game of hide-and-seek using FRS radios and introducing Morse code. I’ll detail them in a future article.